[POSTED 2019-04-14] I don't think so. [PENDING] [POSTED 2019-04-14] I don't think so. Server(s) you most play on: Pug,JB,Course. Why you deserve to be promoted: I've been playing Swoobles! for a fairly long time, and there aren't many situations I can come across anymore that I don't know how to deal with. I know all my rules by heart at this point, and I love the community. The only thing I can see holding me back is toxicity. I know I can be toxic and annoying, but I don't want to post a "Im changing thread" or a "How do you feel about me" because I dislike that. The reason admin apps have more effect with this is they make people shape up, for a certain amount of time, and im hoping that I will improve. I know I probably wont get level 3 this time, but I'll try to improve to the point where people are confident in my administration skills. Neutral - Good admin, nice player, attempts to enforce rules however influence is limited by being overshadowed by others. I think you’d Make a decent level 3 as you have a high knowledge on jb intricacies. If you just dropped the meme some times I think you’d be an excellent 3, contrary to your OP I don’t think you’re toxic at all, just maybe sometimes need to know when the joke is stale. Excellent player and good friend, good luck. One of the best lvl2s out there. Always approaches me in a kind manner as he does to any other player including casuals. Amazing rule knowledge and a very friendly and mentor-ish approach to casuals, and always respects his senior admins. Lvl 3 would definetely benefit him along with the community. I have not played with you in a hot minute but when I did, you were a little bit annoying/toxic. You need to know sometimes to chill with your attitude. +0 Very dedicated and active. 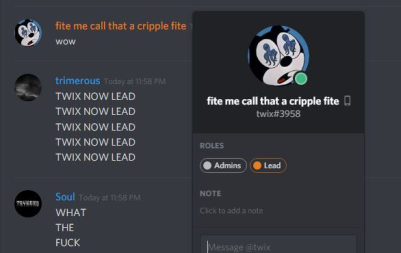 Trying his best to be a good admin. Deserves a new set of commands. one of my favorite players but hes very toxic and ive seen him abuse commands a couple times. i would be really scared to have you on the level 3 team. (04-14-2019, 09:15 PM)luck Wrote: one of my favorite players but hes very toxic and ive seen him abuse commands a couple times. i would be really scared to have you on the level 3 team. Imo, you’re a good dude but you don’t have the best rule knowledge for jailbreak, and I’ve seen multiple admins and people who are not admins have to teach you rules. from being on the same server with you I can strongly say that you being level 3 is a pipe dream with how you behave and comport yourself. I would hate to see it happen and it's not because I don't like you, but because from my point of view, I would want the servers I love to play on to be moderated properly and be a fun environment, as is intended. Giving more authority and privileges to you does not seem to go hand in hand with the improvement of the servers. I do not mean to be disrespectful with this rep but I believe that applying for a position of authority should be met with the truth however how harsh it is and that the applicant should not be coddled and be given too much lenience. Level 3s should be above all a good role model for the community and I just don't see you being a good role model yet.